Razz Poker is a variation of Seven Card Stud but the big difference is that the winner of the pot is the player who makes the lowest hand and not the highest. 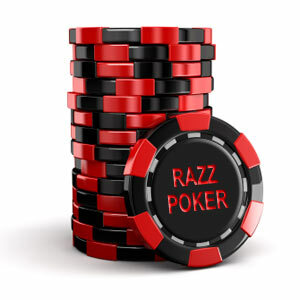 Razz is growing in popularity as a result of poker players maturing and wanting to learn new games that are a bit different to the usual game of Texas Holdem. Razz is also the R in the popular mixed game of HORSE which has also seen a rise in popularity in recent years so as a result there is a knock on effect of players wanting to learn how to play Razz Poker. So… How do you play Razz Poker? As with all Stud based games, Razz is played with Antes instead of Blinds. In Razz each player will receive seven cards in total through out the hand. Four cards will be face up for all to see and three cards will be face down which only the individual player can see. By making the best qualifying 5 card hand from the low poker hand rankings. By making a bet that no other player calls. If this happens all chips in the pot at that time will be awarded to that player and the next hand will start. Unlike the low qualifying hands in games like Omaha Hi Lo or Stud Hi Lo where a low hand must “qualify” by all individual cards being different and numbered 8 or lower, this is different in Razz. There are no qualification requirements in Razz and all hands can qualify to win. Straights and flushes do not count against a low hand as they make absolutely no difference and are not counted in any way. Pairs in Razz count as a high hand and are not good to have, but a player can still win with a Pair in their hand if the hand is still the lowest, for example if other player(s) hold a higher Pair in their lowest five cards. Aces are always counted as low so the best hand possible in Razz is 5-4-3-2-A (the best possible hand is called “the nuts” in poker terms). Cards are always counted down from highest card to the lowest card so if some one had 8-7 low against some one with 8-6 low, it does not matter how the other three cards run the 8-6 low will win. For more information on low poker hands then see our guide to low poker hand rankings. Razz has five betting rounds in total which is the same as Seven Card Stud. It can be played for a wide variety of stakes and is most commonly played with a Limit betting structure, in which the bets are in fixed increments. For example, in a $0.25/$0.50 limit game the bets are in increments of $0.25 on the first two betting rounds, and increments of $0.50 on the subsequent three betting rounds. 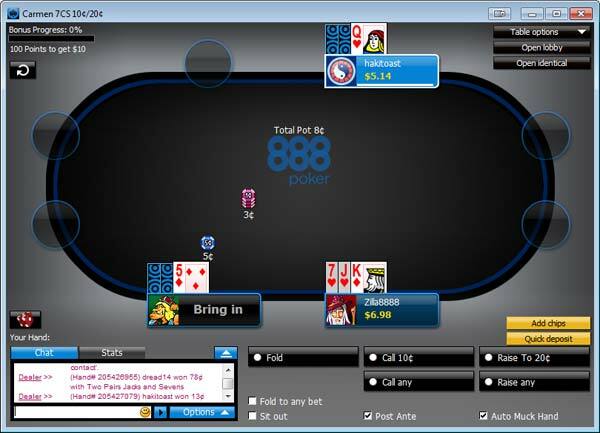 A Razz Poker hand commences by placing the “Dealer Button” in front of a single player. 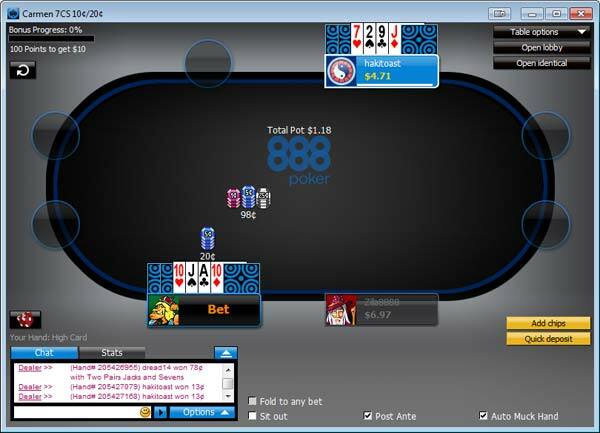 The position of the dealer button changes each hand and rotates around the table in a clockwise direction. The Dealer Button is a marker that is used as a reference point by the dealer. This marker is moved to each player in a clock wise rotation after every hand. In Razz the dealer button indicates which player receives the first card from the dealer. The player to the left of the dealer button will be dealt a card first and the deal will continue in a clockwise rotation with the last card being dealt to the player on the dealer button. This order is maintained for each round of cards that is dealt. Once the dealer button has been allocated to the player whose turn it is for this hand then all players will be asked to put an Ante into the pot. The Ante is an amount of chips that all players must “Ante Up” or in other words put chips into the pot. This is a nominal amount and is the cost of being dealt into the hand. This ensures there are chips to be won on every hand. The Ante amount is normally 1/10th of the full bet (or 1/5th of the small bet) for the table stakes you are at. So for example on a $0.25/$0.50 table the ante would normally be $0.05. This may vary slightly depending on the poker room you play at. One card is dealt face up which is exposed for all players to see. This is called the “Door” card. Each player now has one exposed card, their Door card, which is visible to the entire table. The player with the lowest Door card is asked to “Bring In” and becomes the first player to act in the first round of betting. The player with the lowest exposed “up” card (their Door card) will be the first player to act and will be asked to “Bring In”. This term just means a forced bet which one player has to make which kicks off the betting. The size of this bet varies depending on where you play but is normally a little more than the ante and somewhere around half of the Small Bet. For example on a $0.10/$0.20 table the bring in will be around $0.05 (Ante $0.01, Small Bet $0.10, Large Bet $0.20). The Bring In player may choose whether to just place the bring in bet into the pot or alternatively they can make a raise to a full bet allowed in the first round of betting which is the Small Bet amount. The “Bring In” is the signal for the start of the first round of betting. The betting starts with the “Bring In” player who can choose to either bet the bring in amount or raise to the small bet. Then going around the table in a clockwise rotation each player will have three options. Fold – which means they throw their cards into the dead card pile (called the “muck”) and will take no further part in the hand. Call – they can match the bet that has been made. Raise – they can raise the current bet. The raise amount is fixed to the same value as the low bet amount and any further raises must be increments of this amount. During any betting round there are only four raises permitted. In the first round of betting all raises must be in increments of the low betting amount. So on a $0.25/$0.50 table each raise must be in increments of $0.25 and no more. There are only four raises permitted on each betting round. Once this limit is reached then no further raises are permitted and players will only be permitted to call. To continue in the hand all players must put in equal amount of chips into the pot. Each player will be dealt one further card from the dealer. This card will be dealt face up for all players to see and is called “fourth street”. The second round of betting will then commence starting with the player with the lowest two cards showing face up and exposed to the table. Each player has two options on how to proceed – Check or Bet. Check – which means they do not have to put any chips into the pot and the action moves onto the next player. If all players decide to check then the hand moves onto the next stage. Bet – The second option is to bet. Like the first round of betting all bets in the second round of betting must be in fixed increments of the low betting amount. So on a $0.25/$0.50 table each bet or raise must be in increments of $0.25. Once a bet has been made by a player, the other players will be given the option to either fold, call or raise. This continues until all players remaining in the hand have put an equal amount of chips into the pot and the next stage starts. The dealer will deal each player a 5th card, which is once again dealt face up. Each player now has 3 exposed cards and 2 cards which only they can see. Another round of betting will start in the same way as the previous betting round – starting again with the player showing the lowest three exposed cards. The difference now is that the bet limit changes to the high bet amount set at the table. So on a $0.25/$0.50 table each bet or raise must now be in increments of $0.50. The maximum of four bets / raises per round still remains. The dealer will deal each player a 6th card, again dealt face up. Each player now has 4 exposed cards and 2 down cards which only they can see. This street is identical to the fifth street and another round of betting will start again using the higher betting limits. The seventh and last card is dealt to all remaining players face down and at this point all players will know what their best five card low hand will be. A final round of betting is made at this point once again using the high betting limits in the same way as fifth and sixth street. If we reach the end of seventh street and two or more players have put in an equal amount of chips into the pot, then we get to the Showdown. The Showdown is where all remaining players reveal their cards to each other to determine who has the best low hand. If there is a tie the pot will be split between all winning players equally. If at any stage during the hand a player makes a bet or raise and no other player decides to call that bet then the pot is won by that player with out having to continue with the hand or reveal any cards. Razz Poker is not the most popular game played and so it is not as easy to find a game as the more popular poker games such as Texas Holdem. In fact not all online poker sites offer Razz tables. If you want to try Razz then you should head over to our Play Poker section where we can recommend to you an online poker site that is trusted and also offers Razz Poker tables. Practise is the best way to learn, so pick a low value stakes Razz Poker table and just experiment until you get used to all the stages above.